We are Flagstaff, Arizona's first choice for residential and commercial window cleaning services. Get a free window cleaning quote from our company online now! We offer residential window cleaning services to the entire Flagstaff metro area. We are Flagstaff, AZ's commercial window cleaning company. Ask about our maintenance programs. AZ Window Cleaners is Flagstaff Arizona's first choice for residential and commercial window cleaning and window washing services. Our company services the entire Phoenix metro area. At AZ Window Cleaners we train our technicians to clean your Flagstaff property windows in the safest way possible, being careful to follow all home and building safety code requirements. When an AZ Window Cleaners technician arrives they will inspect the windows on the job site, confirm the price, let you know exactly how they plan to execute the window cleaning , and answer any questions you might have to ensure your complete satisfaction. In Flagstaff, you have many choices in window cleaning services but our experience combined with proper training and cleaning techniques makes AZ Window Cleaners the right choice for your window cleaning project. Our customer service and dedication to our Flagstaff valley customers is not easily matched. Call us today for a free window cleaning quote! Residential window cleaning services in Flagstaff, AZ. 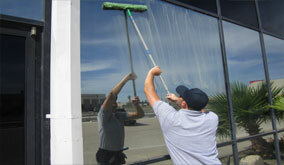 Commercial window cleaning services in Flagstaff, AZ. Our window cleaning company in Flagstaff, Arizona separates ourselves from our competition by paying attention to our customers most basic window cleaning needs. AZ Window Cleaners understands, as consumers, and home owners ourselves, we care about the very same things that you do. Wearing shoe covers equates to less dirt in your home, eliminates scratches on your hardwood floors and reduces the chance of carpet stains. It’s just one of the many ways AZ Window Cleaners communicate how important your home is to us. And just another reason why we are Flagstaff, Arizona's first choice for window cleaning services. One of the most unique things about using AZ Window Cleaners to clean your Flagstaff property is our 48 hour rain warranty. Rain alone will not mess up your newly cleaned windows. It’s the airborne dirt that gets mixed with the rain water on your windows that makes your windows dirty. At AZ Window Cleaners, we want you to feel good about the money you spend to have your windows cleaned. So, if it rains within 48 hours after we have cleaned your windows, AZ Window Cleaners will be happy to come back and touch up any affected windows free of charge. This means you can get your windows cleaned during the Flagstaff monsoon season and still feel okay about spending the money. Call today for a free quote! At AZ Window Cleaners we offer both interior and exterior window cleaning services in Phoenix and other cities valley wide. However, you can choose whether you want both or only the exterior or interior windows washed. We carry all the equipment in our work vehicles to reach most “hard to reach” windows up to 4 stories high. Window cleaning services include the cleaning of the glass plus the window sills. For and additional charge we also clean screens and tracks. Call today for free window cleaning quote on your Flagstaff property. We offer both residential and commercial window cleaning services. We are Flagstaff, Arizona's first choice for residential window cleaning services. Call today for a quote! 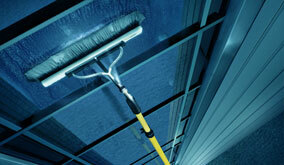 We offer services that most window cleaning companies in Flagstaff neglect. Learn more below.